Arlette Lyons, Fiona Walsh, Ruth Bowie, Sarah McGuinness, Julie O Donnell, Agatha Corcoran, Deirdre Conroy and Gaye Edwards all from TMFRA. TFMR, A GROUP campaigning for the right to termination of pregnancies for medical reasons in Ireland, has said this evening that it has handed an amendment on the Protection of Life During Pregnancy Bill 2013 to government. Its members said that over the last number of weeks they have been working to try and include fatal foetal abnormalities in the upcoming bill, and received legal advice that this is possible. Their amendment has gone to the Government and TFMR said “it is now in their hands to legislate for this”. The group are now calling on their supporters to contact their local TDs to ask them to vote on the amendment. They described this as “the most critical stage that our campaign has reached”. Speaking to TheJournal.ie, Arlette Lyons said that legal experts drafted the amendment, which was then handed to Deputy Richard Boyd Barrett and members of the Oireachtas Health and Children Committee. Each party will have to agree on the amendment and vote it through for the bid to succeed. “That is why we are trying to get as much support as we can,” said Lyons. She said that should the amendment be added to the Protection of Life bill, it would be “amazing” – but not just for the TFMR group, for “people tomorrow and the next day” who have to undergo a termination because of a fatal foetal abnormality. She said she has been contacted by many couples about this, and that it is “happening every day”. “It’s for everybody else that unfortunately is going to have to go through it,” she said of the amendment. If the amendment is not added to the bill, the next step would be to see if TDs would submit a private members’ bill from September on the issue. Another possibility is a referendum to repeal the 8th amendment to the constitution, which would be a larger task. Earlier today, the Protection of Life During Pregnancy Bill was introduced into the Dáil by Health Minister James Reilly. The moment set up what is likely to be weeks of debate on the bill. TFMR offers support to women whose babies have been diagnosed with fatal foetal abnormalities. The group’s website can be found here. They can be reached by email: tfmrireland@gmail.com. Support group Leanbh mo Chroi can also be found on Facebook, or contacted by email at leanbhmochroi@gmail.com or by telephone on 086 747 4746. Email “Amendment to abortion bill on fatal foetal abnormalities handed to Govt”. 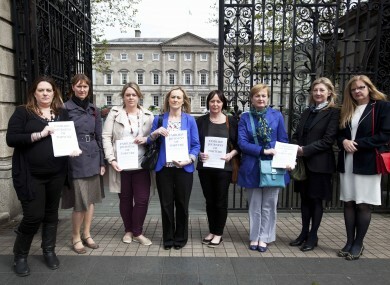 Feedback on “Amendment to abortion bill on fatal foetal abnormalities handed to Govt”.